As France is based in Zrenjanin our coverage of the 2011 FIBA Europe U20 Championship has covered all the games from this venue. 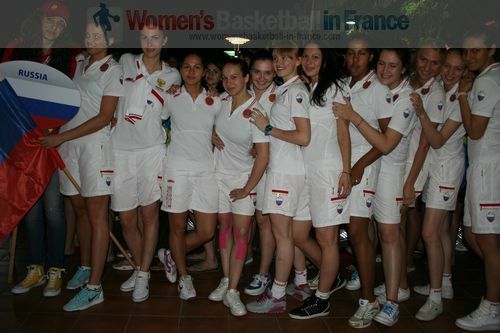 However in Novi Sad, fans of the Ligue Féminine de Basket-ball (LFB) would be interested in the Ukraine team because of Olesia Malashenko who played in France for two seasons with Arras. Germany and Romania are the big losers from the preliminary round. Neither side won a game and found themselves having to play in the relegation group. Of the eight teams based in Novi Sad, Romania and Germany 1991 born players are the only ones to have experienced playing in Division B at U16 and U18 level. Germany played in Group A with hosts Serbia, Poland and Ukraine, a difficult group with all the teams dropping at least one game. Romania have one of the youngest teams here with only three 1991 born players in the roster. They were in Group B with Lithuania, Russia and Turkey. Serbia ended up finishing top of the group on point average only. They lost a cliff hanger in overtime to Poland (73-76) on day 2 despite 28 points from Sara Krnjic. Magdalena Zietara fired in 27 points for Poland in that match. Serbia had to dig deep the following day to get past Germany to secure the group win. For Ukraine Alina Iagupova is once again lighting up the tournament just piping Malashenko in the scoring charts. After starting with a loss to Serbia on the opening day they picked themselves up to beat Germany and then edge out Poland. Russia always come into FIBA youth tournaments as one of the favourites and at U20 level they have won this championship five times. However the 1991 generation had always had a bad day at the wrong time. They cruised in their first two games but were given a fright from Turkey and in the end needed Alexandra Tarasova's 2 free-throws in the dying seconds to win the match (64-63). With the situation in Group A, Russia have the best starting position for the qualifying round as they are alone on top of the table. Lithuania have not been firing on all cylinders but had enough in the tank to get past Turkey and Romania. Turkey were competitive but the results are against them. On the first day of the qualification round Russia were pushed all the way against Ukraine and only took control of the match in the last five minutes. A three-ball from Yana Panevina tied the game. Alexandra Tarasova then found her scoring touch and Russia were on their way to victory with 11-0 run to win the game (61-53). Russia join France and Spain in the quarter-final of the U20 European Championship. Poland stunned Lithuania with a remarkable recovery to make up a 15-point deficit on their way to a (67-60) victory. Malgorzata Misiuk was the hero with 20 points and 11 rebounds. Serbia had to wait until the second half of the match to put away Turkey (64-53) with 19 points coming from Maja Vucurovic. Turkey cannot afford to drop any more games if they hope to qualify for the quarter-final.